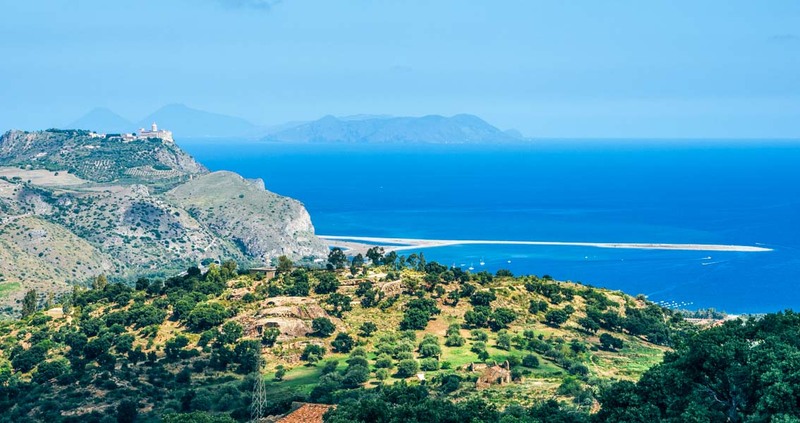 The Sanctuary of Tindari is located on the top of the Mount Tindari and dominates the small Lakes of Marinello where you can admire stunning views of the Tyrrhenian Sea, the Aeolian Islands and the sandy Sicilian bay. The Sanctuary of Tindari is a place of pilgrimage and a location of extraordinary archaeological ruins which attracts many visitors from each corner of the world. This fascinating place is located on the top of the Mount Tindari and dominates the small Lakes of Marinello where you can admire stunning views of the Tyrrhenian Sea, the Aeolian Islands and the sandy Sicilian bay. This area has an evocative atmosphere thanks to the Greek ruins which frame the southern part of the site, and on the north-west is where you’ll find the Roman baths, displaying stunning floor mosaics. In the summer they put on performances in the old 4th century BC theatre of Greek plays. The Sanctuary of Tindari was built on the ruins of the Tindari Castle which was build in 1950s and contains the famous statue of the Black Madonna. This statue of Byzantine origins is dated back to 800 AD, and was carved from a rare Turkish cedar wood. The legends tell that the ship carrying this Madonna was driven onto the Tindari bay after a violent storm. According to popular belief, the Black Madonna has a miraculous power which protects Sicilians from many dangers including earthquakes, pestilence, and the attacks of armies. Today the Black Madonna stands behind the altar with the inscription ‘Nigro sum sed formosa’ (I am black but beautiful) at the base of the sculpture.